We are part-time student teachers of the MA degree study of Information and Communication Technology Education at the Faculty of Education in Prague to become a qualified ICT teachers. In the compulsory course „Didactics of IT Education IV“ we had a task to develop in a teamwork a final semestrial work. 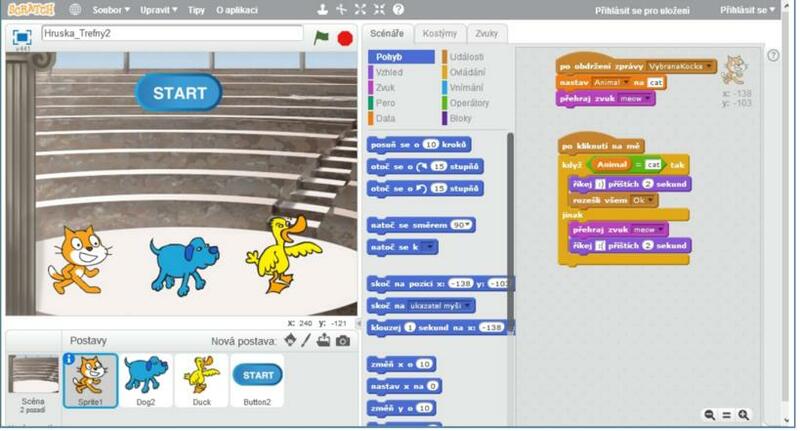 Such a decision implies to solve a technological problem how to connect a robot with Scratch application to be able to control a robot in Scratch and then to design an assignment for pupils to work with a robot through programming in Scratch. A game can attract an attention as a form of entertainment and it can also offer an interation. We expect to program a game on a similar principle as „professional“ games for smartphones and tablets can be a challange for pupils to struggle to penetrate to basis of programming and computing. Our aim was to design an actitivity in Scratch for pupils which can be program in a relatively short time – during two school lessons. We spent a time thinking about a character of a computer game. At the end, we decided for a game as a quiz.